Located in the St. James Power Station, Singapore’s iconic beer has a reconstruction of the original Tiger Brewery and a 4-D special presentation for its TigerLIVE experience. We were taught how to tap a cold Tiger Beer and given Tiger glasses as part of the tour package. A super cold one was a fitting way to end a hot week in Singapore. The price of alcohol is very high in Singapore. Tiger Beer, for example, ranged in price from $3.20 in a grocery store to $18 in Clarke Quay restaurants. Singapore offers great variety in food choices as referenced in earlier entries. For lunch, we sampled Vietnamese food from the Orange Lantern in Vivo City. For our last meal on the island, we feasted on some Middle Eastern tastes at the Kazbar. On our way home as we stretched our legs in Tokyo’s Narita airport duty free stores, hawkers offered unusal samples: tastings of Chivas regular and royal and different sakes. A great end to a great week. Fodor’s Singapore’s 25 Best was one of the books used to explore Singapore. During our week long stay, we visited many of its recommended sites. 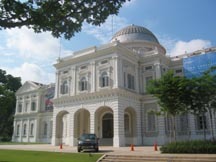 The National Museum of Singapore was not listed as a top spot, but should be so considered in the next edition. We spent about two hours in the Singapore History Gallery just scratching the surface of Singapore’s history from the 14th century to the modern period using the Companion, a multimedia handheld device. It has an LCD display, a pair of Senhauser earphones, and a keypad that enables audio, visual, and textual content that complements the Museum’s physical collection. We were able to read descriptions, listen to expert opinions and dramatized scenarios, as well as watch videos related to the artifacts. 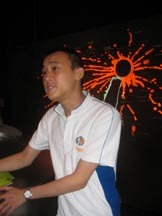 This state-of-the-art technology allows a high level of interactivity. What a great way to explore Singapore, and highly recommended. Another book, although not easily available in the U.S., that helped us explore this city state is Discover Singapore on Foot. Dominque Grele and Lydie Raimbault share the nooks and cranies of Singapore in 18 suggested walking tours. Tour books often recommend how to see Singapore in two or three days. More time in this wonderful place allows for a much greater appreciation of what Singapore has to offer. Kampong, the Malay word for “village” and Glam which derives its name from the eucalyptus tree is the place to learn about the Malay population, about 14% of Singapore’s population. 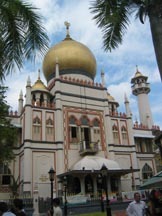 The impressive golden domes and minarets of the Masjid Sultan Mosque, built between 1924 and 1928, show that this area of Singapore is part of the Islamic world. The cemetary of Kampong Glam is the oldest Malay cemetery in Singapore. It is located near a Muslim Cemetery on Victoria Street. The Malabar Mosque, with a blue and green mosaic tiled facade, is Singapore’s only Malabar Muslim mosque. Malabar Muslims originally came from the coast in the southern state of Kerala in India. The Malay Heritage Centre was formally the Istana Mapong Glam built around 1840 for Tunki Ali, Sultan Hussein’s son. Sultan Hussein ceded the island to the British East India Trading Company. Bussorah Street is where I found a batik shirt at Molkan Fabrics for a good price. My lunch of rice and three vegetarian dishes at the Albert Food Centre was only $2. Kampong Glam is another interesting section of Singapore. During World Warr II, some 50,000 civilians, Allied troops, and prisoners were incarcerated in Singapore. Exhibits at the Changi Prison Chapel and Museum portray the terrible conditions they endured. Before this trip I reread Tyler Thompson’s memoir, Freedom in Internment: Under Japanese Rule in Singapore, 1942-1945. Tyler’s wife Phyllis evacuted prior to the fall of Singapore. Tyler, one of my favorite professors, begins his story with the march through the city when he weighed 191 pounds; three years later he weighed 127. His writing discusses the self-government that the internees developed; their care and feeding programs; educational and cultural activities such as having all volumes of the 14th edition of the Encyclopaedia Britannica, classes, lectures, a debating society, concerts, choirs; the camp health service; and camp religious life. Tyler learned chess during this time and we played many postal games over a priod of many years. Initially Tyler and the other civilian internees where housed in Karikal houses. 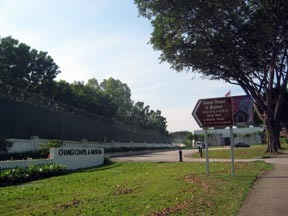 Later they were transferred to Changi Civil Prison. Their final days were spent at the Sime Road Camp. He makes special note of the double tenth on Oct. 10 1943 by the Kempei Tai who confiscated two radios. Before traveling to Singapore I also read James Clavell’s King Rat. Tyler presents a much more positive view of his time spent in internment. He says that the “High morale of the community resulted from our response to circumstances beyond our control which led to an unusually sensitive democratic government and rich cultural and religious life” (155). It was touching to see the cover of Tyler Thompson’s book displayed as a part of the American experience in the Changi Museum. The sights, smells, and sounds of Little India make a visit to the area around Serangoon Road a mult-sensory experience. The Sri Srinivasa Perumal Temple is dedicated to Lord Vishnu, a deity associated with faith and womanhood. It has a 20-metre high gopuram, adorned with statues of deities. The Leong San See Temple, the Dragon Mountain Temple, is a buddhist temple originally built in 1917. The Sri Veeramakaliamman Hindu Temple is dedicated to the Goddess Kali, the consort of Shiva. 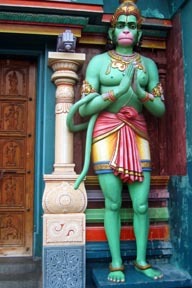 The colorful image of a monkey man, Hanuman, is especially evocative. The Khalsa Dharmak Sabha Sikh Temple has a facade in soft shades of ochre. The Mustafa Centre is a multi-storied shopping complex with two floors devoted to gold jewelry, one floor packed with the latest technological gadgets as well as a full supermarket. Off of Pitt Street we walked through a flea market with the remants of just about everything. The shophouses included several devoted to bathroom fixtures and machine repair. We found a place with curry puffs and other delicacies available for takeout. Little India is a special treat. Jurong BirdPark has some 600 species and more than 9,000 birds housed in avaries and large open enclosures. A nocturnal bird house features a system of reverse lighting, converting day to night. On display are 31 birds from 9 species, like Snowy Owls. The African Wetlands allowed us to snap pictures of close-up encounters with a Blue Crane, Saddle-billed Storks, and Shoebills. The air-conditioned panorail provides a panoramic view. We deboarded at the Lory Station and enjoyed the Lorry Loft, a 3,000 square metre, 9 storey high flight aviary with more than 1,000 free-flying colorful lories. 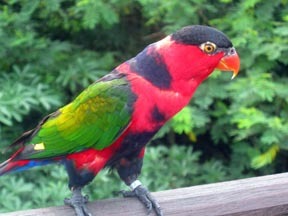 We also toured the Birds of Paradise and Hornbills & Toucans exhibits. At the Waterfall Station we entered the world’s largest walk-in aviary with more than 1,500 free-flying birds from over 60 species. The waterfall is said to be the tallest man-made waterfall in the world. African Guinea Fowls and Golden Breast Starlings were among the birds feasting on live worms. Pelican Cove housed 7 species of pelicans, including a squadron of Great White Pelicans. Our final stop was the Penguin Expedition. The five species and more than 200 penguins appeared to be cramped and out of place with the rest of the tropical birds. There was a crowing rooster, but no turkeys as we celebrated Thanksgiving in a foreign land. Jurong BirdPark is for the birds, and those who love them!